Sukkot, a Hebrew word meaning “booths” or “huts,” refers to the Jewish festival of giving thanks for the fall harvest, as well as the commemoration of the forty years of Jewish wandering in the desert after Sinai, the Exodus from Egypt. Symbolically, the Sukkah represents the portable huts the Hebrews lived in while moving throughout the desert. Sukkot is celebrated five days after Yom Kippur on the 15th of Tishrei and is marked by several distinct traditions. One tradition, which takes the commandment to “dwell in booths” literally, is to build a sukkah. A sukkah is often erected by Jews during this festival, and it is common practice for some to eat and even live in these temporary dwellings during Sukkot. Many Jewish families in our community still build a sukkah at their home today. This also commemorates the agricultural season which falls at the end of the autumn fruit harvest. The sukkah has at least 3 sides and is open on the top. 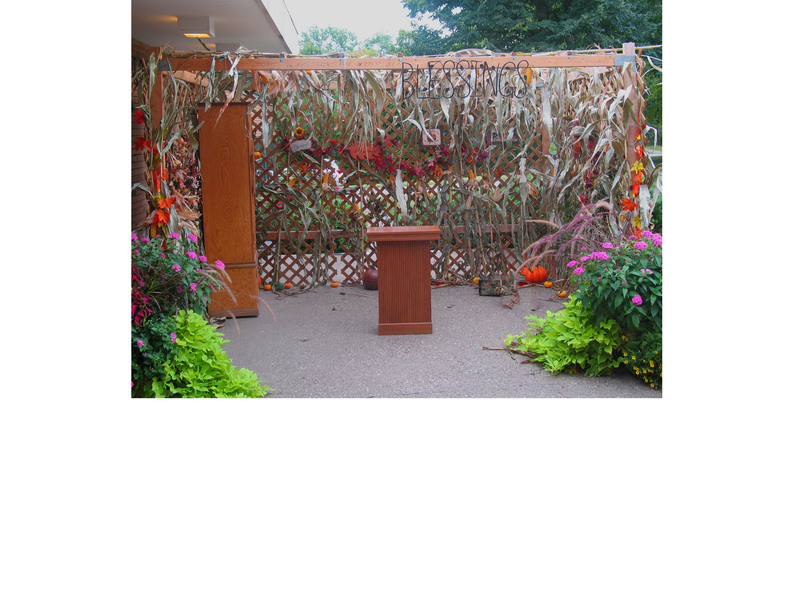 We cover our sukkah with cornstalks which provides some protection, but also open so the stars can be seen. Usually it is decorated by the children of our congregation with hard-skinned fruit and vegetables of the fall season.